The global rice husk ash market is fairly fragmented, finds Transparency Market Research (TMR). Several players are engaged in innovative ways for making high-value commercial use of rice husk ash (RHA), in order to cement their foothold in the market. Governments across various countries world over are taking an interest in boosting their commercial applications by providing substantial incentives. In this context, a number of players are expected to bolster their investments in developing cutting-edge technologies such as in making novel biomass power plants for generating energy from rice husk. Furthermore, these players are likely to enter into strategic collaborations to consolidate their shares and stay ahead of others. 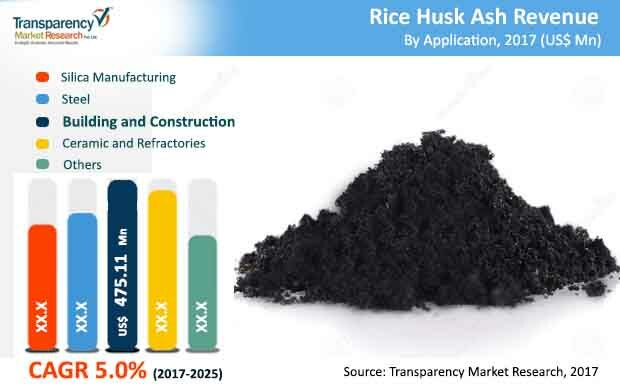 The global rice husk ash market is markedly witnessing rising waves of consolidation, precipitated by a number of mergers, acquisitions, and partnerships in recent years. Key players operating in the market include Jasoriya Rice Mill Pvt. Ltd., Agrisil Holding., Agrisil Holding., Agrilectric Power, Yihai Kerry Investments Co Ltd, Usher Agro Ltd, and Wadham Energy, LP. The global rice husk ash market stood at US$1.06 billion in 2016 and is projected to rise at a CAGR of 5.0%, vis-à-vis value, during 2017–2025. By the end of the forecast period, the global rice husk ash market is estimated to reach a worth of US$1.64 billion. The application areas where RHA is used can be segmented as building and construction, steel, ceramic and refractory, silica manufacturing, and others that majorly includes water purification, soil fertilizers, and 0il absorbents. Of these, the building and construction industry segment accounts for the dominant share in 2016, owing to the widespread use of RHA as building and cementing materials. The substantially rising demand for RHA in the cement industry is also fueling the growth of the segment. On geographic front, Asia Pacific holds the sway and it accounted for the major share of over 65.0% in 2016. The regional market is likely to retain its dominance throughout the assessment period. The rice hush ash market is driven by extensively rising applications in various end-use industries, primarily in the building and construction industry. The wide range of applications of rice husk ash emanates from the rich content of amorphous silica RHA has. The substantial use of RHA in producing light weight construction materials, which finds large use in making durable cement and high-strength concrete. The substantially rising applications of RHA in the road construction activities is a notable factor boosting the market. The growing use of RHA in constructing nuclear plants and in the cement industry are accentuating the growth the market. The noteworthy use of RHA is attributed to its potential as inexpensive supplementary cementing materials of high performance characteristics, thereby fueling its demand in price-sensitive countries. The remarkably rising use of RHA in the construction industry in numerous less developed regions, notably in Asia Pacific, is accentuating the growth of the market. The noteworthy potential of RHA in making cost-effective blended cements to meet a variety of specifications is catalyzing the growth of the global market. However, rice hush ash produced from the burning of rice hush poses a noticeable environment threat if not disposed of properly. The improper dumping of RHA may cause severe human health concerns to worldwide populations. In addition, despite several promising applications as construction materials, the adverse environmental impact of RHA emissions is a critical concern. All these factors may limit the growth of the rice hush ash market. Furthermore, governmental curbs to control harmful emissions in developing and developed nations may also hinder the demand for rice husk ash. Nevertheless, relentless research in various parts of the world to realize various high-value and novel applications in end-use industries is a significant factor that bodes well for the market. The potential rising avenue for the use of RHA making value-added silica based materials useful for a variety of practical applications is a notable trend expected to boost the market in the coming years.